Ganpril Webrid is a carter, delivering and selling items from the cart handed down to him through his family for generations. That cart is like an old friend; it goes everywhere with him. It’s a little refreshing to have a “hero” who isn’t handsome or angst ridden, or even vaguely dissatisfied with his lot in life. Webrid definitely fits this description. He’s happily vending his latest consignment of jamboro cakes. Sales aren’t doing too well so Webrid decides to call it a day before the afternoon smog sets in, and then things gets hinky. . . .
He’s mugged by a robot. Webrid is left with a bit of a headache and that’s all, though in one eye, he sees a weird green pattern similar to a tree. It’s surprising to go immediately into the plot, instead of having to endure numerous pages or chapters of setup. Author Johnson gets us there within paragraphs. Webrid’s encounter with the robot happens on page one. Soon the “Second-State Licensed Carter” has more to worry about than a headache, however. There’s now a green light shining between his eyes. A couple of threatening criminal types get incinerated when it touches them. What’s even odder—in Webrid’s view—someone has deposited 12 million dendriacs in his account, paid his rent a year in advance, and bought him a First-State Universal Carter’s License. Webrid takes these last two in stride, but worries about the first one. Out of town means going to the planet Cheed, which turns out to be a partial mistake. On the way, he learns his license was paid for by one Rempener Dras, but who or what is this person? Even the Vox, the all-knowing, omniscient, omnipresent purveyor of everyone’s life isn’t talking . . . and that right there is cause to worry. There are plenty of alien sounding words in this story, and it’s pleasing to find them merely mentioned without long explanations as to their origin or meaning. Without insult to the reader’s intelligence, they’re used in such a way one can infer from the context and move on. The name “Rempener Dras” opens doors, where none should for a simple carter. Along the way, Webrid acquires a bnarli, a device to hide the green light shining from his forehead. He also learns what’s been implanted in his head . . .
Webrid thought he could feel his chain being yanked. Reasoning that what Rempener Dras hired him to do was deliver the light, and the robot-mugger was the method by which it was brought to him, the carter in Webrid is momentarily satisfied. He has an employer, he has a package, he’ll do what he’s hired to do…deliver the package. New problem: How and to whom? Webrid learns the hard way. Soon he’s up to his hairy ears and taloned paws in members of the Swarattan Resistance Force, the greedily ambitious Cheed Council Secretary, and police bots. He’s jumped by a local crime gang, beaten and chased, captured and escapes from all manner of unsavory characters who only have one goal: to obtain the light inside his skull by any means possible. Through it all Wegrid behaves with characteristic aplomb. Saved once again by circumstance rather than his own ability, he accumulates a group of occasionally helpful friends and gains a hideout . . . the SRS Draspar, a Swarattan Roving Ship disguised as a floating office building. The Fekli twins, leaders of the Resistance; Debley, slender, brown-eyed and skinless; and his sister Leshi, for whom Webrid has a more than lustful interest. They seem to know more about Webrid than he does but are woefully reticent to share. Zatell is a female rocket scientist who’s all head surrounded by a sunburst ring of arms. She also pilots people who need to fly under the local law enforcement radar. Stravin, a white-feathered city engineer who invents items for criminal enterprises. He tags along simply so he can experience an adventure. Azhanda, a furry little Zenivar who’s as polite as most of her species but appears to know more than she’s telling. She also is the most levelheaded of the bunch. Last, but not least, Webrid’s grandpa’s cart, getting more beaten with each mishap but still rattling along. “And so it came to pass that Ganpril Webrid, lowly carter of Bargival, found himself on a clandestine tour of Cheed’s uncharted northern hemisphere.” With this intrepid band, Webrid and his faithful cart will discover once and for all what the light contains and how it’ll help the Resistance and get the answer to the burning question: Why did Rempener Dras pick him to deliver it? Told from Wegrid’s point of view, this is a witty narrative. Its sharp retorts, comical situations, and zany characters—from Wegrid himself to the many-armed, sun ray-like Zatell—make it laugh out loud hilarious in spots, as do the far away places of Cheed, Bexilla and the Raralt Circle and the strange-sounding names of geffir fruit, janz rolls, and druken Edjenels—whatever they are. 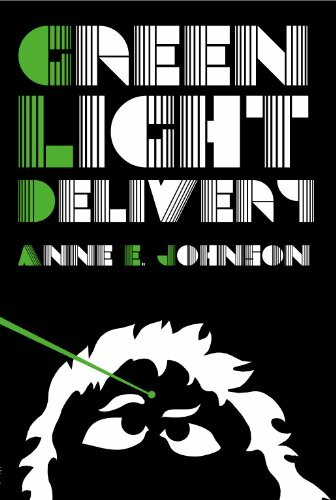 For those who like their science fiction with a generous injection of humor, Anne E. Johnson’s tale of a mission improbable—though nowhere near impossible—will hit the spot. It’s a hilarious and entertaining read.